What if we could predict water availability with greater accuracy? Shea Wales, a graduate of Fort Lewis College, helped develop a system using colored beads to track plants that were unidentifiable early in the season. As part of a study to understand how watersheds work, researchers are studying how recent trends, such as snow melting earlier in the year, change plant cycles. Fort Lewis College alumni Chelsea Wilmer and Shea Wales carry gear to a study site in the Elk Mountains near Crested Butte. They are joined by Elizabeth Ballor, who was a summer independent research student at the Rocky Mountain Biological Laboratory, and Patrick Sorenson, a postdoctoral scientist at the Berkeley Lab. 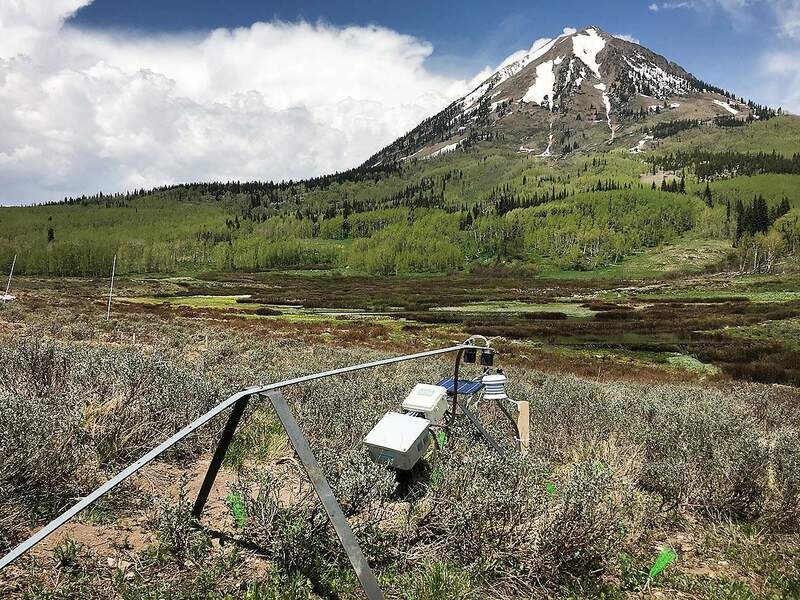 The study is part of a U.S. Department of Energy research project aimed at understanding and predicting the quality and quantity of water moving through mountain systems in the West. 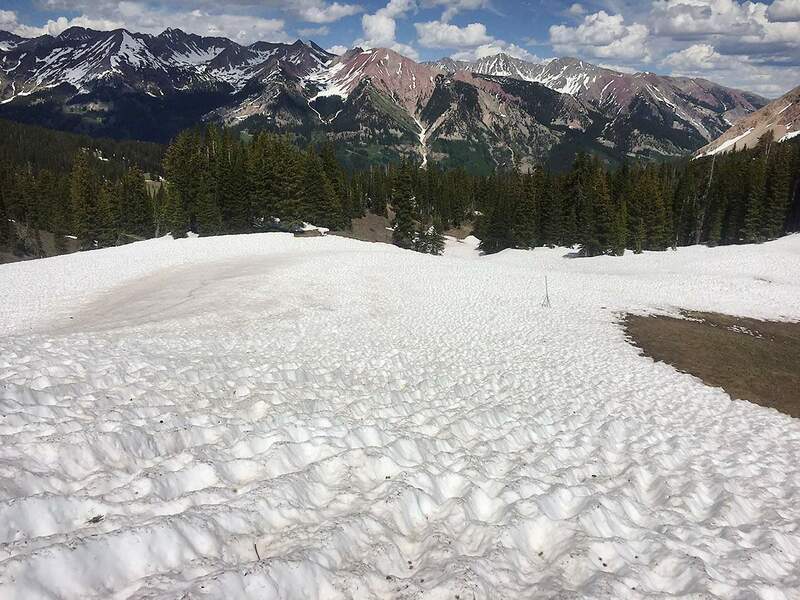 Snow melts in early June in the Elk Mountains near Crested Butte. Researchers are working to understand the watersheds and the levels of nutrients, metals, carbon and salt that will be carried into local rivers. The data collected in the study will help create models to predict the water quality and quantity in other watersheds. Equipment set up in the upper montane of the Ruby Mountains tracks information, including snowmelt, soil moisture, how green the ground is and temperature. Researchers are working to predict water flow in the Western United States – in the same way meteorologists predict weather – to help cities, ranchers and emergency managers make crucial decisions about water management in a changing climate. 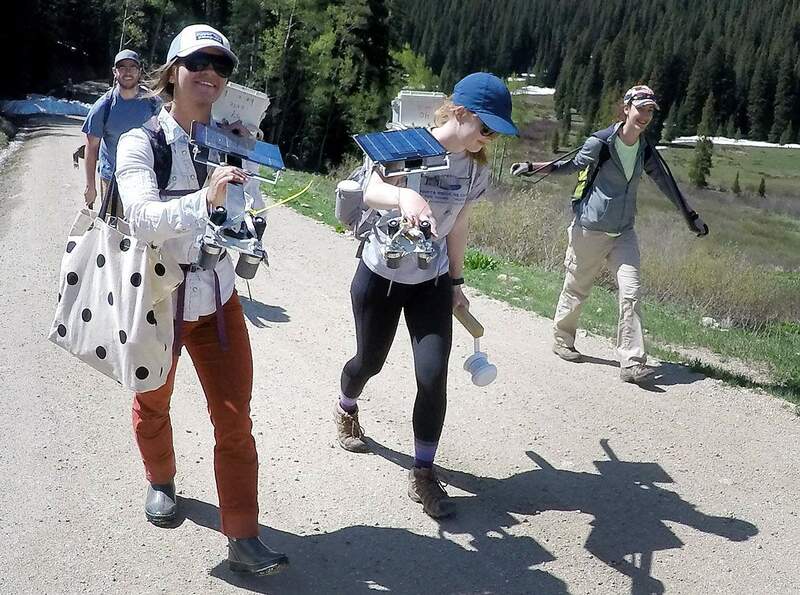 The work is focused on forecasting the quality and quantity of water flowing into rivers from mountainous areas, said Heidi Steltzer, an associate professor of biology at Fort Lewis College and an executive committee member working on the project. Forecasts will make short-term and long-term predictions – from what will happen in one day, in a month or annually – for watersheds across the Western U.S. and beyond, she said. “You could bring (the model) to the Animas River Valley, you could run the model and we could do a better job managing for water,” she said. The forecasts could provide better answers to questions such as: “How much water is going to be available for agriculture? Do cities have the water they need? ... Do species that live in and around the water corridors have the water they need?” Steltzer said. Researchers aren’t looking to make predictions hundreds of years into the future, but they want to make accurate predictions as the environment and the system change over time, she said. For example, they are working to understand the effect snow melting earlier in the year has on the watershed system. The predictions will also assess what water is bringing down from the mountains, such as nutrients, dissolved salt, dissolved organic carbon and metals. Better water-quality data will help water-treatment managers make long-term decisions about what equipment is needed to treat water to preserve the taste or perhaps strip out certain metals, such as cadmium, said Kenneth Williams, deputy lead and chief field scientist for the project. The multimillion-dollar project received its funding from the U.S. Department of Energy in October 2016. 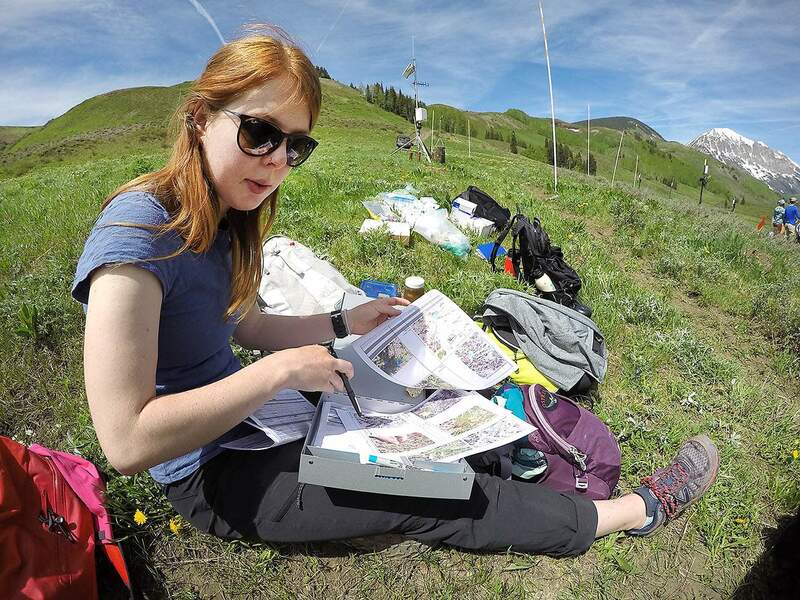 Researchers are working in the Elk Mountains near Crested Butte, where they plan to collect data in four watersheds. The project’s federal funding will be reviewed every three years, and there is no predetermined end date, Williams said. More than 70 researchers have received funding to work on the project, and other scientists are doing independent projects that build on the core work funded by the Department of Energy, Steltzer said. The National Oceanic and Atmospheric Administration’s National Water Model already predicts how much water is expected in rivers and reservoirs, but the forecasts have not been as accurate as they could be in recent years, Williams said. “Our site is a testbed, not just for our own research interests, but also as a testbed for NOAA to help really dig into the physics that underlie model predictions for snow accumulations, snowmelt and water flows,” he said. Like weather forecasts, the improved water quality and quantity forecasts will be publicly available, Williams said. “As it moves forward, you will undoubtedly see a broader portfolio of apps and other resources that allow individuals to get stream-forecasting information on their cells,” he said. Current model inaccurateThe current forecasting model for predicting water in rivers and streams has not been as accurate in recent years, because it relies on snotel sites that measure snow on the ground, and snow at those sites is melting earlier in the season with warm weather, Williams said. In Colorado and California, the historical placement of the snotel stations are at low enough elevations they are missing a significant fraction of snow later in the spring, he said. Warm storms are delivering snow, but it’s accumulating deeper and wetter at higher elevations, he said. To improve forecasting, the focus is shifting to airborne observations of snow from airplanes, helicopters and satellites, he said. The researchers are working in partnership with NASA’s Jet Propulsion Laboratory and its Airborne Snow Observatory, a plane outfitted with specialized equipment, to collect information about snow depths and how much water is embedded in the snow. The data collected from the air is less precise than information collected at snotel sites, but it can be collected from a much larger area, such as an entire basin or state, and while it’s not perfect, the data provides a better forecast than the current system, Williams said. To make forecasts that rely on snow, bedrock and plant data gathered from the air, researchers must first collect highly detailed information on the ground to understand the watershed system and to create mathematical forecasting models and test those models, he said. For example, Steltzer is focused on understanding the plants in the system, their ability to hold onto nutrients and elements in the mountain soil and how early snowmelt will affect those plants. Tracking plantsDepending on the timing of snowmelt, rain and temperature, plants sprout in a different order, and part of her mission is to learn if there are gaps in plant growth, or times when the plants aren’t growing as they normally would. “The hope is that there is enough diversity of plants within a plant community that fills all the gaps,” she said. “If the gaps get filled, the nutrients stay in the mountain hillslopes, and if there are gaps, then the nutrients end up in our rivers,” she said. Heightened levels of nutrients, such as phosphorous and nitrogen, in rivers can cause algae blooms. More algae ultimately leads to more microbial activity and lower oxygen levels, affecting the health of fish and other animals living in the water. To track the growth of plants, Steltzer and her team designed a color-coded system to track all the sprouts of plants as they emerged and then identified them as they flowered, she said. This year, Steltzer will create early snowmelt conditions, even earlier than what may naturally occur if snow accumulation remains low, at various elevations to determine how it changes the growth patterns of plants. Collecting granular data can help researchers determine how species are changing their growing habits, which species fill gaps in water use and nutrient demand, and find out if a species that isn’t abundant is stabilizing key ecosystem functions, she said. If you didn’t collect the detailed data, “it would be like telling a romance story without knowing who fell in love. The story for these hillsides may be about the rock star, such as glacier lily, which many know well. And sometimes, the story is about the ‘little engine that could,’ a plant without showy flowers that doesn’t green first or last, but is able to grow under the best and worst conditions,” Steltzer said. Collecting the granular data also allows researchers to determine what is important to include in the final forecasting model. Eventually, researchers will map plant distribution and their utilization of water and extend the data gathered on a small scale over a large area, Williams said. Mapping bedrockResearchers are also mapping the bedrock in the watersheds to understand how groundwater flows through it. They are interested to know how water moves through rock based on how fractured or solid it is, how thick it is, and its elevation. “(Groundwater) winds up being a really important component in driving stream flow in periods like now, when you’re well, well past runoff and well, well past any kind of monsoonal precipitation,” he said. The relationship between the water and the bedrock also helps determine the level of metals in the water. Incorporating a subsurface map of bedrock in a mountainous environment into a forecasting model has never been done before, Williams said. Understanding the level of groundwater can also help researchers understand acid rock drainage, or water laden with heavy metals. Minerals tend to be more stable under low-oxygen conditions, and having a high water table can keep them from getting into the ground water. If the groundwater drops for a long period of time, then the conditions are right for the water to start carrying more metals downstream, he said. In addition to aerial mapping of the bedrock, researchers have taken rock samples to provide detailed data to help build their models. Much of the researchers’ work is focused on gathering detailed data on snow depth, snowmelt, temperature, water, nutrients, metals and bedrock to build a complete model. “You can imagine a situation now where these models are making predictions about the whole water cycle, how water is moving from snowpack to snowmelt, infiltration into soil and groundwater ... then routing that water to stream flow,” Williams sad. As the models are refined, researchers will try to pare back the amount of detail needed for a forecast as much as possible so that the model can be applied in many areas. Fort Lewis College professor Heidi Steltzer will post updates about her work on Twitter and Instagram as @heidimountains. FLC alumna and research assistant on the project Chelsea Wilmer will post updates on Twitter @chelsinthefield and on Instagram @ouichelsfaye. Heidi Steltzer’s Twitter handle has been corrected.